With no apparent relief to California's record-breaking drought, Los Angeles has turned to more unusual methods to protect the city's water. 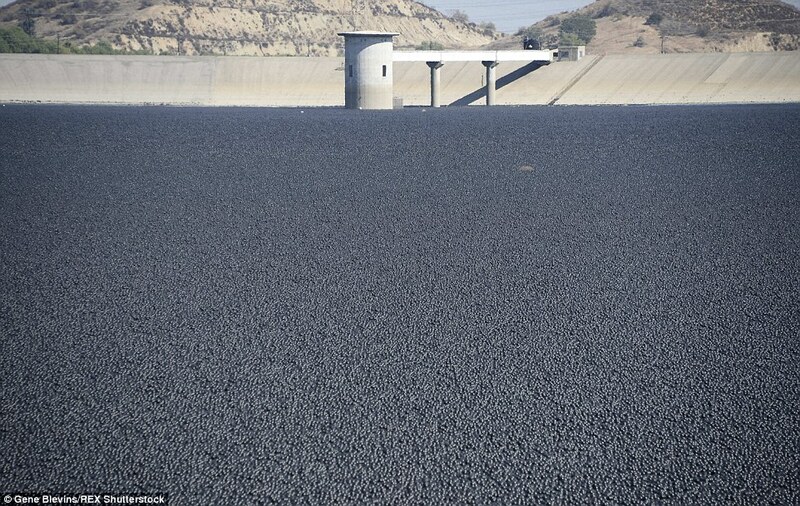 Officials recently released 96 million floating 'shade balls' into the 75-acre Los Angeles Reservoir in Sylmar, California. 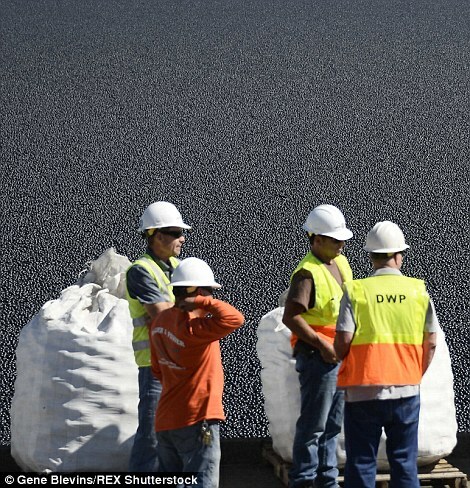 The black plastic balls are designed to help protect the water against dust, rain, chemicals and wildlife, as well as prevent 300 million gallons of water from evaporating each year. HOW DO THE SHADE BALLS WORK? 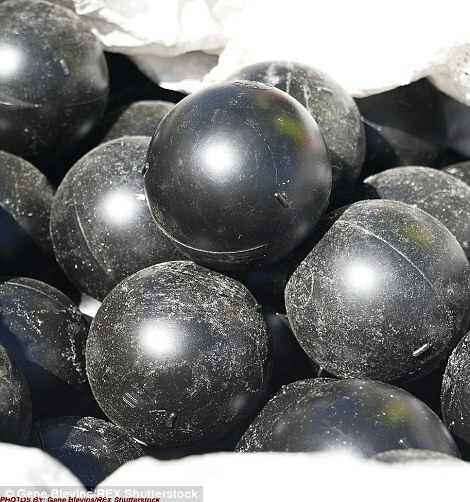 The plastic black balls, around the size of an apple, cost 36 cents each. They floating on the surface and block the sun's rays to prevent water from evaporating. By doing this, they prevent the chemical reaction that creates the carcinogenic compound bromate. The balls also form a protective barrier across the surface that helps keep birds, animals and other contaminants out away. The balls work by floating on the surface and blocking the sun's rays. As well as protecting against evaporation, they also prevent the chemical reaction that creates the carcinogenic compound bromate. For most people, exposure to bromate - created from naturally-occurring bromide in water -is unlikely to be cause problems. But some people who ingest large amounts of bromate have suffered nausea, vomiting, diarrhea and abdominal pain. The balls also form a protective barrier across the surface that helps keep birds, animals and other contaminants out. Dr Brian White, a now-retired Los Angeles Department of Water and Power (LADWP biologist), was the first person to think of using shade balls for water quality. 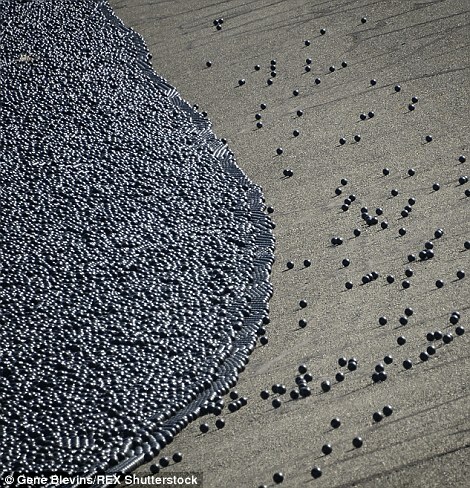 The idea came to him when he learned about the application of 'bird balls' in ponds along airfield runways. His in-house solution has been used in LADWP's open-air reservoirs since 2008 to block sunlight, prevent chemical reactions and curtail algae blooms. The balls, around the size of a large apple, cost 36 cents each and are black because it is the only colour that is able to deflect UV rays. They balls work by floating on the surface and blocking the sun rays to prevent the water from evaporating. By doing this, they also prevent the chemical reaction that creates the carcinogenic compound bromate. They are currently in place at Upper Stone, Elysian and Ivanhoe reservoirs, and come with the added benefit of reducing evaporation off the reservoir surfaces by 85 to 90 per cent. 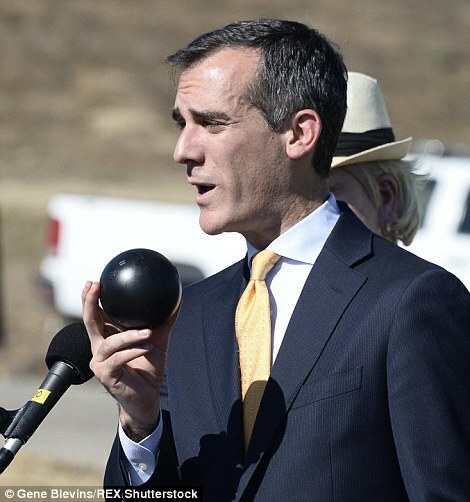 Mayor Eric Garcetti joined officials yesterday to release the final 20,000 shade balls as part of the region's $34.5 million water quality protection project. 'In the midst of California's historic drought, it takes bold ingenuity to maximize my goals for water conservation,' Garcetti said. 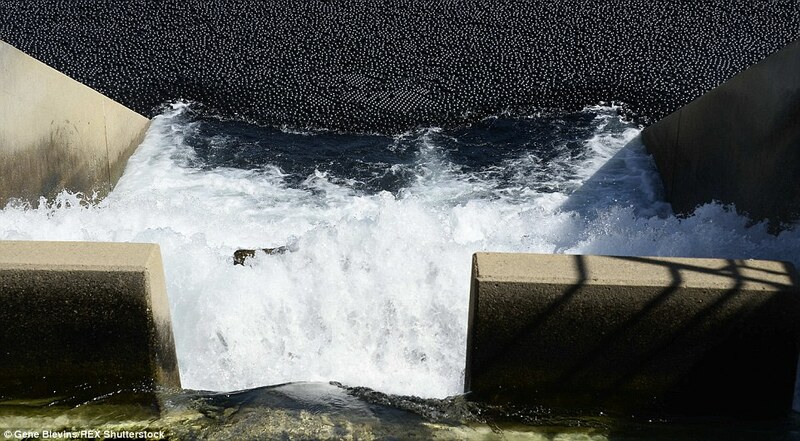 The polyethylene balls are expected to save $250 million when compared to other, similar techniques to protect the water. These include splitting the reservoir into two with a bisecting dam; and installing two floating covers that would have cost more than $300 million. 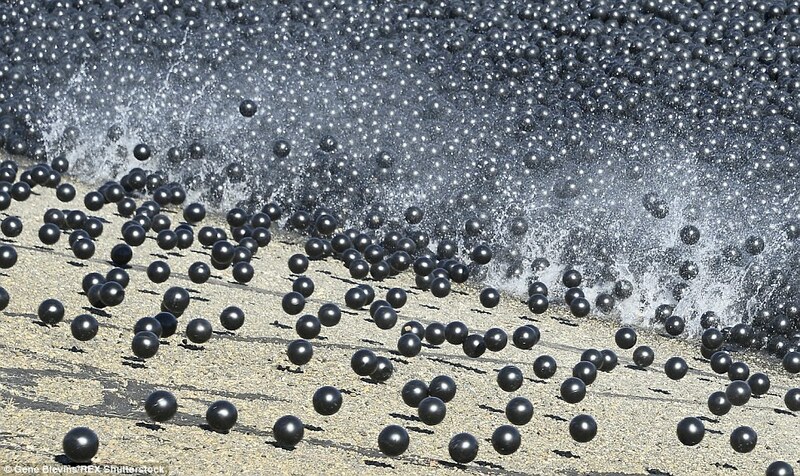 'In addition to cutting back on the need to chemically treat our water to prevent natural occurrences like algae, these shade balls are a cost-effective way to reduce evaporation each year by nearly 300 million gallons, enough to provide drinking water for 8,100 people for a full year,' added Councilman Mitch Englander. Dr Brian White, a now-retired LADWP biologist, was the first person to think of using shade balls for water quality. 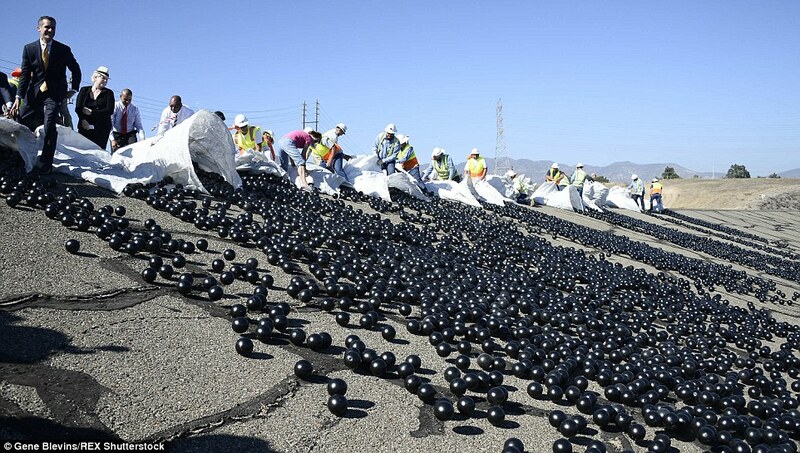 The idea came to him when he learned about the application of 'bird balls' in ponds along airfield runways.